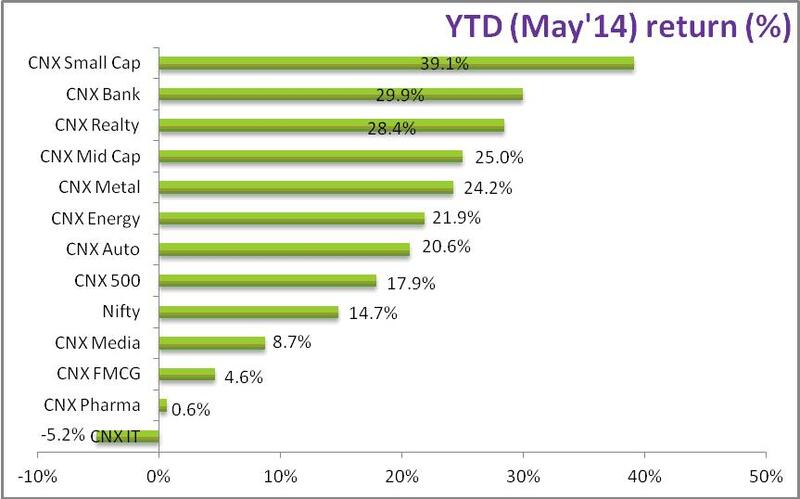 How is YTD (May '14) Performance review is calculated? The Indian equity market started the month on cautious note with disappointing earnings from some blue chip companies such as ICICI Bank and Maruti Suzuki and anxiety over the outcome of the general election. However, market rallied strongly after the BJP led NDA secured majority in the Lok Sabha election. The BJP led NDA won 336 seats whereas UPA alliance suffered humiliating defeat. Election result served as a catalyst for the market as it gave hope that the new government will take corrective measures and tough decisions to bring back the Indian economy on the high growth path. Market believes that strong and decisive government will improve India’s macro economic dynamics in medium to long term. A strong electoral mandate for the NDA government gave ample confidence to foreign as well as domestic investors, which led to consistent FII inflows into India markets. The Rupee jumped to a high of 58.37 per dollar on the back of strong FIIs inflow. 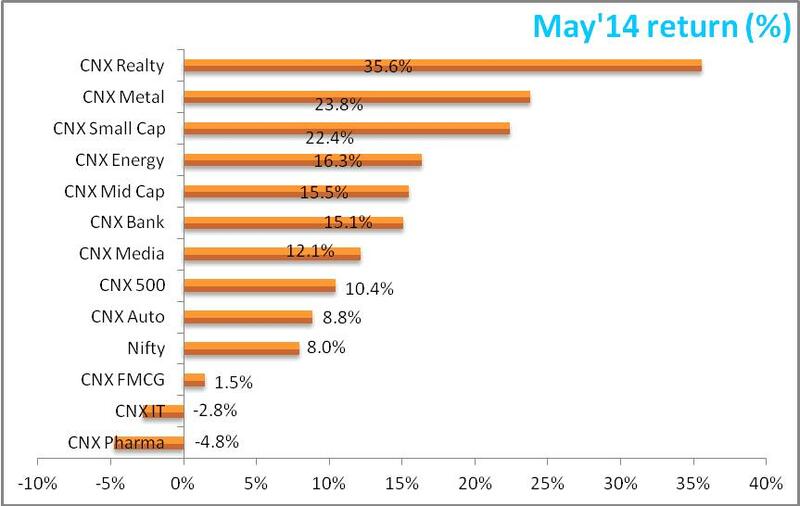 Cyclical stocks from Realty, Metal, Energy and Banking sector outperformed the broader market in May 2014; FIIs have been increasing their investment in these sectors. On YTD basis, small cap stocks took lead posting 39.1% YTD return in 2014. Mid cap stocks was following closely posting 25% YTD gain in 2014. Once again, Banking, Realty, Metal and Energy stocks were the outperformers. Separately, Shares of Coal India climbed after media reports said that the Prime Minister designate, Narendra Modi is reportedly exploring breakup of the company, besides opening up the domestic coal sector to FDI. Coal India shares hit nearly a three-year high on this news. Across the pond, latest data revealed that the U.S. economy contracted in the first quarter of this year. On Thursday, the Bureau of Economic Analysis’ second estimate of real gross domestic product showed output produced in the U.S. declined at an annual rate of 1% in the first quarter of 2014. This is relative to fourth quarter 2013, when real GDP increased 2.6%. Returning to domestic market, investors will now take clue from fiscal policy of new government and the upcoming Union Budget, which is expected to be unveiled in July’14. Monetary policy and inflation data will also be important along with global economic and geo political developments.